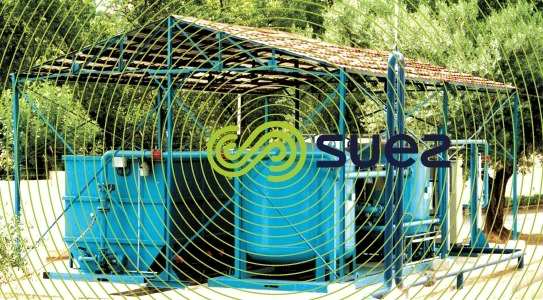 Comprising clarification and filtration, this is the most widespread solution used for producing drinking water from surface water or from groundwater (≤ 500 mg · L–1 suspended solids, capable of operating at a reduced flow rate of up to 2 g · L–1), that is not brackish and that contains no chemical contamination. 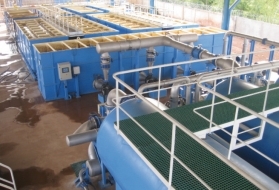 After gravity settling which can be monitored easily, filtration has the advantages of a pressure operation: longer cycles, treated water that can be fed straight into a tank or a network (available residual pressure – 2 bar as standard and this pressure can be increased if necessary). 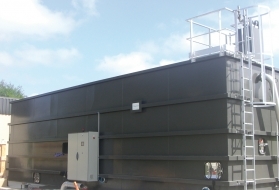 These units can be housed in containers for flows up to 80 m3·h–1. 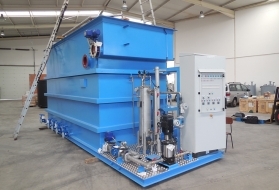 Beyond this value, each skid is adjusted to the dimensions of a container. They can be installed (hydraulic couplings and electrical connections) very quickly and require a simple foundation slab (preferably under cover, see photo 28) and a channel for discharging clarification sludge and filter backwash water into the drains.